I find Ray Lewis' persona, both on and off the field, to be oppressively distasteful. He seems boastful, showy, and hugely self-absorbed. Exhibit A is his presence on the field for the final snap of the Ravens victory against the Broncos (his final home game) to facilitate his signature "look at me" dance. The final snap was a Ravens offensive kneel-down; Lewis is a defensive player. Despite all of this, I'm almost disappointed that he's retiring after this season, because the consensus is that he'll be a "great" television announcer, which means I'll just be subjected to more of him after his retirement than I was before it. Also, there's the fact that he lied to police in an attempt to impede a murder investigation, an investigation in which Lewis himself was implicated. For many years, I used this information to justify my hatred of Lewis. Sure, some of that hatred comes from the fact that I'm a Steelers fan, and Lewis is one of our nemeses. Some of it comes from his self-aggrandizement. But a lot of it comes from my belief that he's a criminal, who got away with a plea-bargain. These feelings came to the surface again several years ago during the national discussion about whether or not Michael Vick (convicted of running a dog fighting operation) should be allowed to play in the NFL again. It angered me that Lewis, present and potentially complicit in the death of a human being, was never so much as suspended, while there was sentiment that Vick shouldn't ever be allowed to play again. The truth about Ray Lewis is this: he made a bad mistake. Very, very bad. He's not unlike me. But I need him to be unlike me. My ability to feel good about myself requires people to exist in the world who are worse than I am. Ray Lewis fills that role. In Nick Hornby's book How to be Good, his heroine (a doctor) is a better person than her husband. One day, though, her husband experiences a spiritual conversion, and becomes (for the purposes of the book) "good." All of a sudden, the wife's world and identity are thrown upside down. She has defined herself as being "better" than her husband...now that she isn't that, who is she? If I can't say that I'm better than Ray Lewis, who am I? What value do I have? Ray Lewis, by all accounts, has completely reformed his life since the incident in 2000. He is a devout Christian, a pillar of his community, and a mentor to many young men. His is a story of redemption, and such stories are what we, the redeemed, should be cheering. I may not be better than Ray Lewis, but that's not a bad thing. We share an incapacitating compulsion to selfishness and sin, and we share in a regenerating love of a Savior infinitely better than both of us. 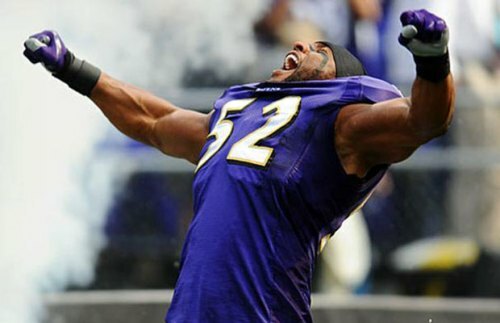 Oh, and one more thing: I hope Ray Lewis and his Ravens get crushed on Sunday.